Los Angeles, January 8, 2018 – Insta360 today launched the Insta360 Nano S, a compact but powerful camera that instantly turns an iPhone into the ultimate tool for capturing, sharing and communicating in 360°. Ready to shoot stunning 4K 360° video and 20 MP 360° photos, the Insta360 Nano S introduces 360° Video Chat and the new MultiView feature – allowing users to show multiple angles of a scene simultaneously and share them via a live broadcast or one-on-one chat. The Insta360 Nano S is a next-level successor to the Insta360 Nano, the groundbreaking 2016 camera that helped establish Insta360 as a global leader in 360° photography. 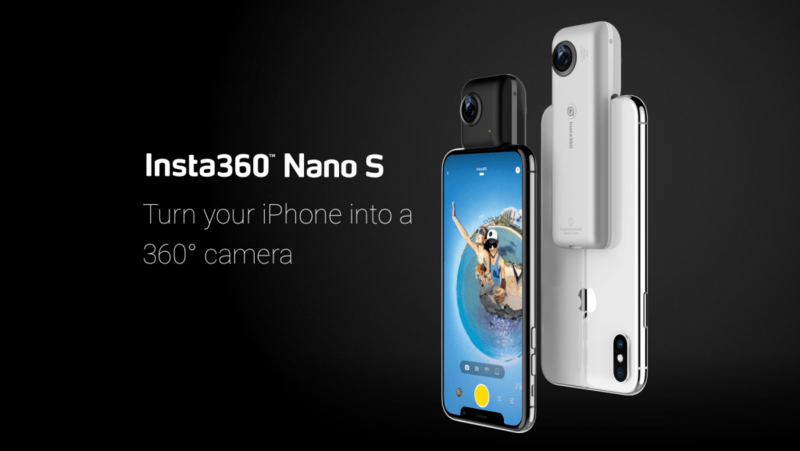 As with its predecessor, the Nano S connects directly to an iPhone’s Lightning port, converting the phone’s display into a real-time 360° camera viewfinder and allowing for convenient capture, storing, editing and sharing of content via the Insta360 Nano S’ companion app. When creators prefer to use the camera as a standalone device, an onboard memory card slot and rechargeable battery make it easy. Part chat app. Part teleportation device. The Insta360 Nano S allows users to make a 360° video call to anyone—regardless of whether the recipient has an Insta360 camera. With a simple swipe gesture, recipients of a 360° video call can freely explore the world from the perspective of their caller. To start a 360° Video Chat, users can simply generate a link in the Insta360 Nano S app and then send it to a recipient via any chat or social app. When the recipient opens the link in their web browser, they’ll get a real-time 360° view of their caller’s environment. Meetings, travel experiences, and calls to family and loved ones, will never be the same. It’s you. And the view. Call it cubism for millennials. MultiView lets users take advantage of 360° video’s unique benefit – capturing in every direction at once – but also gives them the freedom to control a narrative and curate their footage to tell a story in the most effective way. With five different layouts and up to three simultaneous angles, MultiView allows users to adjust the content of each section of a split-screen layout individually. The level of zoom is also adjustable, so that users can zoom out to see a full 360° view projected as a “tiny-planet” in one frame, while focusing on key subjects in another. MultiView is perfect for sharing context or scenery while also capturing a creator’s reactions. The Insta360 Nano S’ MultiView feature can be used for live-streaming and video chat, as well as for editing 360° photos and videos in unique ways to share with friends or followers. The Insta360 Nano S supports Insta360’s industry-leading FreeCapture technology. With FreeCapture, users can reframe the best parts of a 360° video in a standard rectangular frame. The magic of FreeCapture is in the unique method of framing a shot – users can re-capture a scene by maneuvering their phone in real-time to explore a 360° clip, exactly as though they had returned to that moment in time and were filming it with a standard smartphone camera. It’s a clever inversion of the usual work flow – letting users shoot first and point later. FreeCapture empowers people to focus on enjoying the moment while they’re actually living an experience, with the assurance that they won’t miss a thing – in any direction. Then, once the experience is over, they can take their time to review and recapture the best bits. The Insta360 Nano S isn’t big, so it has to be smart. Rather than bulk up the device with an internal gyroscope, Insta360 engineers decided to give the Insta360 Nano S access to the ultra-precise gyroscope that people already have in their pockets. The Insta360 Nano S syncs with an iPhone’s onboard gyro, and corrects for every wobble and shake in real time, using an all-new stabilization algorithm. The result is buttery-smooth footage that’s a dream to watch. In addition to the new MultiView broadcasting feature, the Insta360 Nano S also offers integrated support for 360° live-streaming on YouTube, Facebook and Twitter (via Periscope), letting users share real-time, interactive views of their worlds. Users can easily share their favorite photos and videos to any major social or chat app straight from the Insta360 Nano S app – regardless of whether the platform offers native support for 360° content. For 360°-supporting platforms like Facebook and YouTube, it’s as easy as linking an account and hitting ‘Upload’. 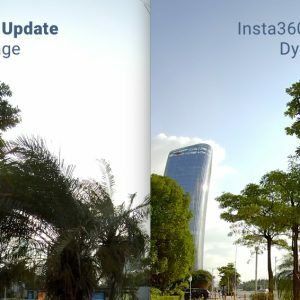 For others, such as Instagram, Snapchat and WhatsApp, the Insta360 Nano S offers a host of ways to convert 360° content into a ready-to-publish form – from customizable 360° photo pan-arounds, to MultiView and FreeCapture edits, to sharing a link to 360° content hosted on Insta360’s free server. Dark. Light. Whichever feels right. The Insta360 Nano S comes in two color options – the stylish silver of the original Insta360 Nano and a sleek new matte black. The Insta360 Nano S has a suggested retail price of $239.00 USD in the U.S. (regional pricing may vary) and is available globally via the Insta360 Store and Amazon. See the Nano S, plus Insta360 future tech at CES. From Jan. 9-12, Insta360 will showcase its full line of industry-leading 360° VR cameras at CES in Las Vegas. Along with a chance to try out the new Insta360 Nano S, visitors will also get an exclusive first look at two never-before-seen innovations from the camera maker. These technologies represent the cutting edge of immersive image capture, and offer a glimpse into the breakthroughs Insta360 has in store for creators. 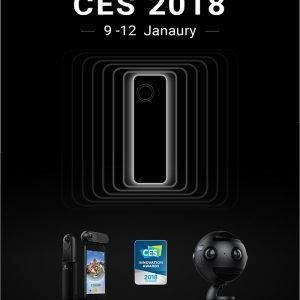 Insta360’s CES booth is located in the Las Vegas Convention Center, South Hall 1, Booth #21200.